Young changemakers! Now is your chance to apply to join the Ocean Heroes Bootcamp this June 28 – 30, 2019 in Vancouver, British Columbia. The Ocean Heroes Bootcamp empowers existing and emerging youth leaders to create their own campaigns to take action against ocean plastic pollution. Last year we focused on plastic straw campaigns, this year the focus will be on campaigns around plastic bottles. I am honored to be a Squad Leader for the second straight year. You won't want to miss this event! Thanks to the great collaboration from a number of organizations and businesses for putting on this amazing event, such as Captain Planet Foundation, 5 Gyres Institute, and Lonely Whale Foundation. I am looking forward to this event in April - a conference addressing the environment in Illinois and of our planet. I will be the Keynote Speaker and there will be Breakout Sessions and interactive exhibits. The audience is primarily classrooms grades 4-12 but the general public is welcome to attend. Teachers can sign their classes up for any or all of the parts of the event. I will be speaking about the power of youth to about 2500 young change makers! Register online at sunfoundation.org! I spoke to several second graders at Clairemont Elementary School in Decatur, GA about plastic pollution and youth empowerment. The kids were recently learning about people making a difference in the world and I was thrilled to be a part of their journey. The Bag Monster made another appearance, too! I was honored and thrilled when Robbie Bond and his parents contacted me and asked me to join them on a beach cleanup in Hawaii. This part of Hawaii (on the island of Oahu) collects a lot of plastic pollution as you can see from the "before pictures". We found a lot of plastic fishing nets, bottle caps, toothbrushes, and a lot of unrecognizable plastics. We had a team of about 15 people cleaning up this beach and made it look presentable, but we know the plastic will be washing ashore tomorrow. This is a global problem with local consequences. What are you doing to reduce your plastic consumption? Thanks to @kidsspeakforparks and @sustainablecoastlineshawaii for arranging this experience. The International School of Brunei held its annual Borneo Global Issues Conference (ISB BGIC) on March 9-10, and I was so honored to be one of their two keynote speakers. I talked about climate change and hopefully motivated and inspired global youth citizens to act. I also spoke on some panels and participated in a radio show interview. The annual summit was aimed at raising awareness of serious world issues such as UN Sustainable Development Goal 13 - Climate Change. See more at https://www.isb-bgic.com. I partnered with the Columbus Zoo and Aquarium in Central Ohio to serve as the keynote speaker for their Teen Eco Summit on November 7-8. This conference was geared towards students between the ages of 15 and 18 who are passionate about conservation; teenagers who recognized there are problems and are ready to make changes in their schools and neighborhoods to make a difference for the planet. They know that schools are major consumers of resources, from energy and water to paper products and food, and schools generate a lot of waste and pollution. After being armed with knowledge and resources, the 150 teens developed campaigns and ideas to make their schools and communities greener and more self-sufficient. I was thoroughly impressed by the teens at the Summit! Under the patronage of His Majesty King Hamad bin Isa Al Khalifa, King of Bahrain, I kicked off the Opening Ceremonies for the First Global Youth Festival in Bahrain, also called the "YouthFull Festival 2018". This event brought together major events and activities supporting the objective of enhancing awareness towards giving back to the community and saving the world through an understanding of the UN's Sustainable Development Goals (SDGs). There were over 1000 young adults present (ages 18-29) and over 100 nations represented. I spoke at the opening ceremonies and also at the end of the conference. I worked with #StudentsRebuild and the Bezos Family Foundation to create a curriculum for students to learn more about the issues affecting our oceans. Included in this detailed curriculum, which is geared to either elementary students or middle/high school students, is an #OceanChallenge where students can send in their ocean artwork and $2 will be donated to ocean conservation and coastal communities by the Bezos Foundation. Contact me for more information. 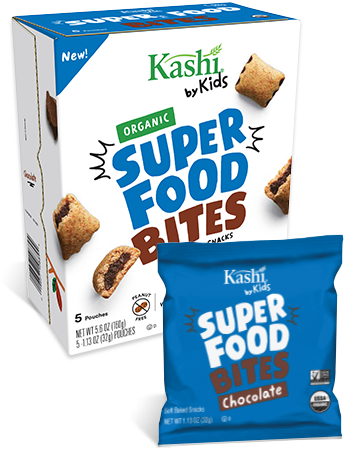 I am honored to say that I worked with 4 peers from across the United States and the company Kashi to develop 3 healthy breakfast cereals aimed at kids. This is believed to be the first time kids were intimately involved in every step of a new product introduction. We are proud of what we came up with - the cereals are organic, non-GMO, low in sugar, high in whole grains and fiber, and more! Two of the cereals are also vegan. After a year in the making, the media launch occurred on Aug 9 in New York City. We also visited a Brooklyn public school and helped with their organic garden to inspire healthy living (and distributed some cereal)! I hope you'll buy and enjoy the cereal! If you care to, post #kashibykids and @hannah4change on social media with your box of cereal! Let's hope that this sparks a new wave of industry innovation where youth are involved in big business - because our opinions ought to be heard! I presented to 420 new faculty at conference/orientation in Forsyth County. This gathering was an orientation for all new teachers in the county and was held at the new high school, Denmark HS. I shared my thoughts on the Learner Profile attribute "Engage & Contribute" and how my teachers throughout the years have helped make me a more worldly, engaged activist. Along with several friends, we cleaned up plastic trash in the Yellow River, a 76 mile river that runs through a small town called Porterdale, GA. After we finished, we met the mayor of the city, who thanked us for what we are doing, and gave us a brief history of how the river has helped improve the town's economy and quality of life. I attended the Animal Rights National Conference (AR2018) from June 28 - July 1 in Los Angeles, CA. It is considered the world's largest and longest-running animal rights gathering, hailing back to 1981. I represented Animal Hero Kids, a wonderful organization in which I am a co-President. I signed and sold books (Animal Hero Kids: Voices for the Voiceless) and learned some incredible information. I joined several friends and colleagues to present to hundreds of Atlanta-area youth at the ​Climate and Sports Student Summit at Mercedes-Benz Stadium in Atlanta on June 27. The mission was to create an environment where youth could be inspired by each other, athletes, and the sports culture to become sustainable change agents. My goal was to tell my story in a fun and interactive way to engage and inspire others to sit up, stand up, and make their voice heard for a better planet. I attended AREDAY 2018 (American Renewable Energy Day) with other eco-leaders near Aspen, CO. This annual Summit brings together 176 cross-sector speakers (including Hannah4Change as the youngest speaker!) and included panel discussions, keynote speakers, a film festival, concert, and environmental expo. I spoke at two panels, met several new changemakers and leaders, and got Dr. Sylvia Earle to sign one of her books for me! I am one of 120 NGOs and thousands of concerned citizens that descended on the US Capitol to march for clean waters and healthy oceans as part of the first-ever March for the Ocean (M4O). This event occurred on June 9th at the National Mall. There were 120 sister marches in LA, San Francisco, Park City, Boulder, Denver, Broomfield (CO), Bozeman, Chicago, Harbor Springs (MI), Port Huron (MI), Buffalo, Hudson River (NY), Woodlawn Beach (NY), Tampa, Palm Beach, Key Largo, Broward County (FL), Honolulu, Maui, Kealia (HI), the Bahamas, London, Dublin and Rio de Janeiro. I was planning to speak on stage but the lightning cancelled the latter portion of the show. Plastic Pollution Coalition hosted a fundraiser and garden party for a few hundred celebrities and select guests in Beverly Hills, CA. I spoke for a few minutes about my story and how youth need a seat at the table. It was a night I'll never forget as I met so many gracious and compassionate people. Young #changemakers gather in California to network, to inspire, and to celebrate! To complement the anti-bullying comment filter announced during the F8 Developers Conference, Instagram co-founders Kevin Systrom and Mike Krieger announced the first-ever #KindnessProm to celebrate young Gen Z leaders who are inspiring their peers by helping kindness, acceptance and support grow on Instagram and in the world. The invite-only Kindness Prom, held in Venice Beach, California, was for inspiring “teen influencers” from around the country including Hannah4Change. It was an experience that focused on positivity, kindness, giving back and community. Charlie Puth sang 3 beautiful songs too. While in CA, I conducted a beach cleanup, met with producer Angela Sun, and networked with inspiring teens. Did you know Earth Day started in 1970? The ​Earth Day Network, the organization that leads Earth Day worldwide, announced that Earth Day 2018 will focus on mobilizing the world to end Plastic Pollution, including creating support for a global effort to eliminate single-use plastics along with global regulation for the disposal of plastics. Forsyth County GA hosted an Earth Day Cleanup on April 21st called #GreatFoCoCleanup, which is an annual litter cleanup hosted by Keep Forsyth County Beautiful and held in conjunction with the nationwide Great America Cleanup. The Bag Monster (courtesy of ChicoBag) even made an appearance to educate the audience on the amount of plastic bags the average American uses each year! Had a great time cleaning up our community while having fun too! I am honored to have been invited to WE Day in Los Angeles, CA on April 19, 2018. WE Day is part celebration, part concert, and part educational conference to inspire, encourage, and motivate action in our community. Leading environmental organizations launched the “Starbucks: Break Free From Plastic” campaign to confront the coffee giant on its plastic pollution problem prior to its annual shareholder meeting in Seattle on March 21, 2018. Using the "power of the people", Starbucks announced some big changes the day before its annual meeting. ​I am proud to be one of more than twenty leading environmental organizations that launched “Starbucks: Break Free From Plastic” — a global campaign demanding that Starbucks take accountability for its contribution to the growing plastic pollution crisis. Here is the petition: https://mobilize4change.org/starbucks. The campaign was formed ahead of Starbucks’ 2018 annual shareholder meeting on March 21, 2018. The coalition gathered at the Starbucks annual shareholder meeting and delivered a petition signed by nearly 1M people. Inside the meeting, Shiloh Britt, a former Starbucks barista from Bellingham, WA, made an emotional appeal to Starbucks CEO Kevin Johnson to commit to following through on the company’s pledge on March 20, 2018 to make a recyclable, compostable cup. 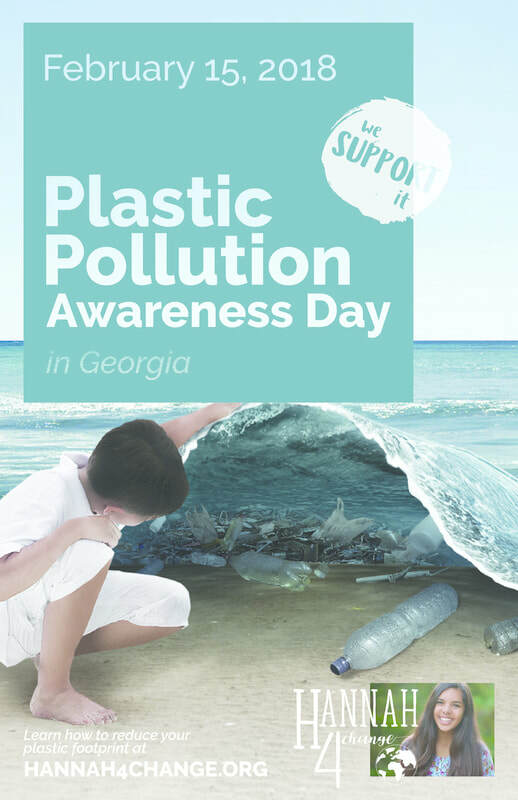 I worked with Senator Nan Orrock to proclaim February 15th as Plastic Pollution Awareness Day in the state of Georgia. Here is a press release with additional details. I was able to speak on the GA Senate Floor - it was a memorable day. I was honored to be invited to the WildAid Gala in Los Angeles, their biggest fundraiser of the year. WildAid's mission is to end the illegal wildlife trade by reducing demand through public awareness campaigns and providing comprehensive marine protection. With ambassadors such as HRH Prince William, Leonardo DiCaprio, Maggie Q, Yao Ming, Lupita Nyong'o, Jackie Chan, David Beckham, Josh Duhamel, and the Cast of the Walking Dead, WildAid reaches 1 billion people each week with the message: When the Buying Stops, the Killing Can Too. At the November 11th Gala at the Beverly Wilshire Hotel, Josh Duhamel was honored for his work. I met Josh, Bo Derek, Maggie Q, and many other wonderful animal lovers. I had heard about projectchimps.org and knew I needed to help. Project Chimp is a beautiful 236-acre sanctuary that is nestled in the Blue Ridge Mountains of northern Georgia, and is home to dozens of chimpanzees. This sanctuary will eventually be home for up to 300 chimpanzees. The property includes several ape housing “villas,” a state-of-the-art veterinary clinic, a brand-new kitchen, and a large chimp-introduction building where chimpanzee groups will be integrated and socialized. I collected donations of food, supplies, and cash and provided them in person on Oct 28, 2017. I couldn't have done this without the generous donations from companies such as Costco, Target, Wal-mart, Sprouts, Kong, Melissa & Doug, Party City, and many others. I also organized a fundraiser at West Forsyth high school and collected several boxes of items, and partnered with the local Girl Scouts as well. ​ This was truly a memorable event! While this event is over, donations are still needed. If you'd like to donate or contribute, please visit their website for additional information. Please join me in supporting the chimps. It's their time to live. And follow them on social media too! Special thanks to Crystal Alba for taking the professional chimp photographs. I spoke to nearly 400 students from college to elementary school in Wilmington NC over a 24 hour period. I spoke about my story and how we can all fight the growing crisis of plastic pollution. The 4 meetings energized me and I hope I energized and inspired young people in Wilmington to follow their dreams and make the world a better place. I was invited to the Plastic Ocean Festival in London on July 18. The aim of the event is to "promote awareness and understanding of the damaging effects of plastic pollution in waterways and oceans and encourage individual and group action to refuse, reduce, reuse and recycle plastic, starting at home in London." I had a memorable time - met amazing people who want to protect Mother Earth. Part of the event was to collect plastic trash. As the pictures show, we collected a lot of trash/rubbish from the Thames River while paddle boarding. I had the honor and privilege to speak to hundreds of girls at the prestigious Wimbledon High School on their graduation day on July 7. I spoke about how each girl can follow their passion and live out their dreams - at any age. I shared my story and what I have achieved at a young age regarding animal activism and fighting for our planet. The students were remarkable, and I hope to stay connected with the school for years to come. The UN World Ocean Festival 201 was held in NYC on June 4. There was a unique Ocean March in New York Harbor and an Ocean Village on New York's Governor's Island which was a celebration of art, education, and tools for action in support of our oceans. I was part of the 2017 Sea Youth Rise Up youth delegation with our aim to empower young people to speak up and take action to protect our blue planet. Before and after the event on June 4, we met with world leaders, scientists, and eco-experts to discuss ocean conservation and spoke on stage during the Youth Rally on Governor's Island. The Green Schools Conference & Expo was held in Atlanta in March. It was a great opportunity to connect with green school leaders for two days of learning and collaboration to support healthy and high-performing schools, where students can learn how to improve the world. Hannah was joined by other eco-warriors as a guest speaker for the conference track dealing with youth empowerment. Partnering with GA Senator Michael Williams and Hannah4Change, the State of Georgia passed a Resolution proclaiming February 15, 2017 as Plastic Pollution Awareness Day at the State Capitol. This was the first event of its kind nationwide, and was an environmental event watched by interested parties across the world. Hannah and other distinguished guests spoke to the crowd of eco-dignitaries, politicians, environmental groups, and business leaders that day at the State Capitol Building in Atlanta. Approximately 400 people attended in person, and over 75 environmental organizations supported the event. In addition, to attract public and media attention, Hannah partnered with 3 professional artists and several student artists to showcase their plastic pollution art. There were educational and artistic exhibits from these artists as well as mermaids made from plastic debris, a traveling pledge quilt, and a mini car/bike that round around the Capitol Building! The Weather Channel, CNN and several local media outlets followed the day's events. Hannah's call to action for this event was for citizens to commit to one way they plan to reduce their plastic footprint. This could be taking reusable bags to the grocery store rather than using plastic bags, or it could be avoiding plastic water bottles. For restaurants, it could be as simple as switching to paper straws or only giving out straws if a customer requests one. Restaurants that switch to paper straws will be provided a window decal they can proudly display that shows they care about their diners and what they put on their tables. Buoyed the success of this event, Hannah is working with partner organizations to get a day declared in other states with the aim of making it another Earth Day! Hannah was a guest speaker at the Algalita POPS Youth Summit near Long Beach CA that brought together 100 youth from 5 countries to fight for a plastic-free ocean. Hannah networked and learned more about plastic pollution and was able to share her story about how she was able to get the state of Georgia to work with her to declare Plastic Pollution Awareness Day. Hannah was honored with a prestigious award from The Captain Planet Foundation. Her award, the Young Superhero for Earth Award, was given at the organization's 25th anniversary gala attended by 750 people including dignitaries and celebrities such as Ted Turner, Laura Turner-Seydel, Jane Fonda, Zach Brown, Ian Somerhalder, CeeLo Green, and more.